Chocolate, marshmallows & nuts? It's a simple combination, but it's what makes Rocky Road so incredible! The only way to make it better…add COFFEE! 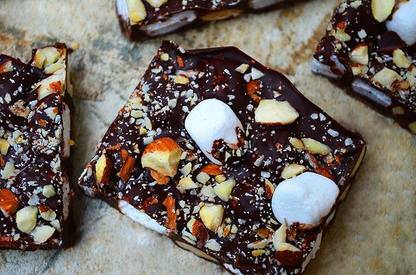 Most people associate Rocky Road with ice cream, but it works GREAT as a bark recipe, too! On a baking sheet, spread almonds into a single layer and roast in a 350 F oven for about 10 minutes or until aromatic. Let cool and then coarsely chop. In a double boiler, melt chocolate until completely smooth. Alternatively, in a microwave-safe bowl, microwave chocolate on high for about 2 minutes, stirring halfway through heating time. Remove from microwave and stir until smooth and completely melted. Stir espresso powder into melted chocolate. Allow to slightly cool. Add almonds and marshmallows and stir to combine. Line a 6-inch baking pan with parchment or wax paper, leaving an inch overhang on all sides. Pour chocolate mixture into pan and with a spatula, smooth top and spread throughout baking pan. Sprinkle sea salt on top and additional chopped almonds, if desired. Refrigerate for about 45 minutes to 1 hour or until chocolate is completely set. With a knife, cut chocolate bark into pieces and store in an airtight container.